Ibi is a small market town - the next town on from Tibi. General information Ibi is located in the extreme Northwest of the valleys that form the Foia de Castalla and to theNortheast to the basin of the river Montnegre, concretely on the foothill of the Menejador and Biscoi Mountain ranges , relatively near the border of the Old Kingdom of Valencia. The village in is placed between two hills where the hermitages Santa Llúcia and Sant Miquel are located. Ibi is a town located in the comarca of Alcoià, in the province of Alicante, Spain. According to the 2002 census, Ibi has a total population of 22,140 inhabitants, an area of 62.5 km² and a population density of 354.24 inhab/km². The town, which is located 37 km from the city of Alicante, is surrounded by mountains and gorges. The Economy of Ibi is chiefly based on the toy industry, the most important of this kind in Spain. As a result, many other related industries have also emerged in the last years: plastic, metal, machinery and so on. There are some factories of construction materials, ice creams and tiger nut milk, too. Some of the most important monuments in Ibi are the Catholic Church of the Transfiguration and the monument to the Three Wise Men, possibly the only one in the world. Ibi History began even before the moors inhabited the Iberic Peninsula. There are traces of an ancient iberian civilization on the grounds. The moors inhabited the place and built two castles, wich show on the city's coat of arms. 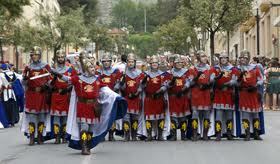 The city was won by the christians during the spanish reconquest, and later got involved in the succession war of Sapin. In the XIX century began a succesfull industry of ice and ice cream. Ibi Landscape There are at the present natural parks with local species, both fauna and flora, and the local authorities have been installing adequate ecological routes to increase and ease the practice of mountaneering and walking. There are several natural parks to visit. Places of Interest The surroundings of ibi are full of historic-artistic monuments, starting with the old town itself, the area is full of religious paintings and sculptures from the medieval times to the churches, small chapels and the historic archive from the city. 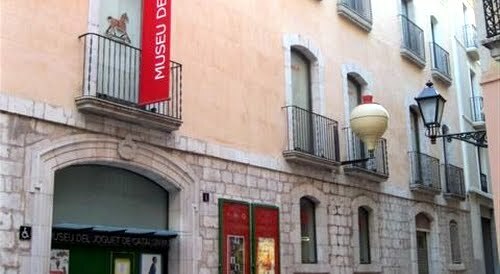 There are two Ibi museums, from which "La Gran Casa del Juguete" is the most interesting. The first Wednesday of September begins the novena in honor to the Mare de Déu dels Desamparats. 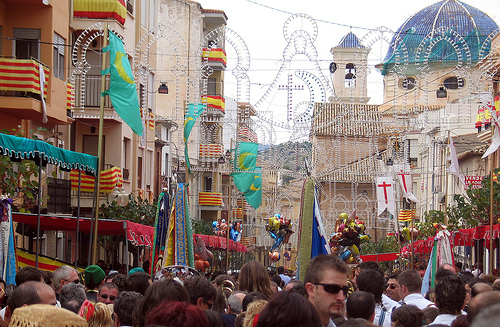 The last day of the novena the celebrations with the "Nit of the Olleta" begin, a parade on the centric streets of the locality. At the first holiday the Entrance is celebrated, divided in two parts: in the morning the Christian Side marches past and the evening brings with it the Moor side. The entrance constitutes of a festive spectacle of great colorfulness with imaginative boatos de capitanes captains and abanderadas. During three days from Friday to Sunday Embassies, firings, Offerings, Execution of the Treasonous Moor, Contraband, Procesión follow one another... the festive families floods the villa with color, music and fireworks. The fiesta takes place each year on December 28, to coincide with the Spanish Innocents' Day - the equivalent of April Fools Day. The Alicante town of Ibi has been celebrating its ‘Els Enfarinats’ fiesta during which a group of local residents take over power from the local government in a tradition which is more than 200 years old. The participants win power from the Town Council in a fake battle with tomatoes, eggs, flowers and bangers. 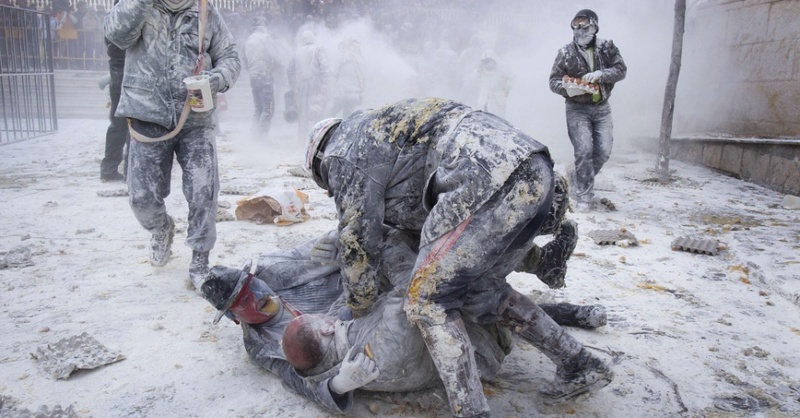 Those who do not obey the new laws of the fiesta are covered with flour and have to pay fines which go to charity. The town centre becomes a large cloud of flour as the fight continues in the church square.